The Results and Discussion section introduces the findings from the conducted research and expands on the written research report. The video below presents the main points and discoveries from the questionnaire. There are also two written articles, based on the interviews and a video, which highlights the most important discoveries from one of the meetings. A semi-structured questionnaire on the platform Typeform, including 10 questions, was sent online to a Facebook chat called ‘Foodies United’. 15 women, currently or previously experiencing an eating disorder have responded. More information about each question below! Q1: Do you believe to be affected by an eating disorder and how would you define it? Q2: Have you shared your thoughts with anyone? 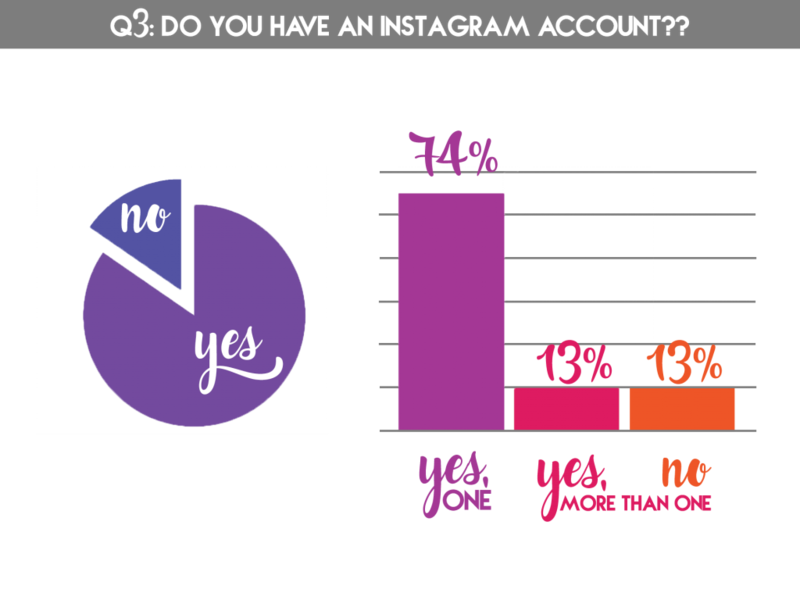 Q3: Do you have an Instagram account? Q4: Is you account somehow connected with the eating disorder? Is you account somehow connected with the eating disorder? Q5: Have you shared thoughts, connected with the eating disorder online? Q6: How willing are you to share personal thoughts connected to the eating disorder with people you know? 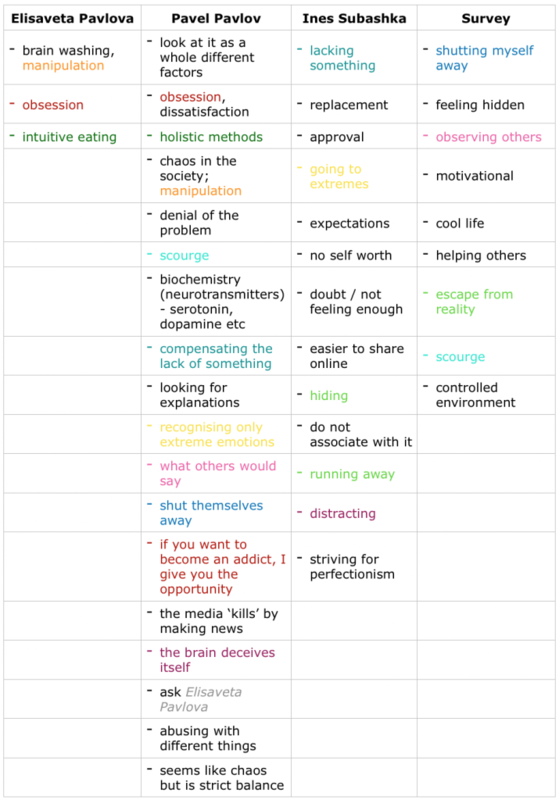 How willing are you to share personal thoughts connected to the eating disorder with people you know? Do you have a problem with “confessing” your eating disorder in front of people you know? The video ‘Inside | Results’ presents the findings from the questionnaire in a visual manner with the use of animations, light music and colours, which correspond to the discussed theme. Through the means of colour coding (Image 1) a conclusion has been made that there are a lot of common answers. Both psychologists stated that media is manipulation and the eating disorders are an obsession. Pavel Pavlov actually recommended speaking to Elisaveta Pavlova and stated that he believes in the holistic methods whereas Pavlova is all about intuitive eating which appears to be a holistic method. Ines Subashka and Pavlov classified eating disorders as going to extremes and recognising only those emotions. A participant in the survey and Pavlov used the word ‘scourge’ for describing the disorder as well as categorised the use of social media as escaping from reality, which was also backed up by Ines Subaska, who not only stated that this is running away but also hiding. Survey participants categorised their use of the social platform as a way of observing others, while Pavlov also pointed this as one of the main reasons for the development of an eating disorder – the worry what others would say. The disorder makes women shut away, which was also identified by the psychologist. This leads to the conclusion that professionals draw the same conclusions, which the eating disorders sufferers have already experienced. It can be stated that face-to-face interviews allow observing body language and reactions. When conducting the interviews all participants were confident in what they were saying. Ines Subashka was smiling and explaining her experience, often without pausing between sentences. She showed how her history with eating disorders shaped her life and changed her understanding of balance – this can also be observed in the video interview itself. Pavel Pavlov was really enthusiastic about sharing his thoughts. He talked very broadly on the topic and by giving lots of examples briefly mentioned the social media side and different journalistic approaches. On the other hand, Elisaveta Pavlova was more salient as she preferred listening to the researcher. She made sure to talk about her work rather than social media in particular. Even though 13 people reveal they have an Instagram account, 12 of them declare there is no connection between their eating disorder and social media. For some it is just ‘a place, where they can ‘observe’ closely the ideally presented bodies’. On the scale from 1 to 10, respondents claim 7.2 on average they are more willing to talk and share in front of people they already know (friends and family). Most people state they do not share anything but follow others as ‘it is sincerely motivational’. A significant result comes from the statement that ‘it is not sharing but rather pretending’ and ‘it is probably easier because it is a controlled environment’, which leads to the thought that even if people do share, they choose to present only their best moments as stated by Ines Subashka. Pavel Pavlov also comments that girls easily shut themselves away and they need certain social approval, which leads them to observing those accounts. Only three people state their account is somehow connected to the ED and 11 state they do not need to share anything or are ashamed. A survey participant states ‘social media was my escape of reality during my hardest periods’. Just a small number of people suggested that they ‘feel good and somehow ‘hidden’ and not as vulnerable’. Expectedly for some people it is satisfactory to share their path ‘if there is even a small change of helping someone, who goes through similar trials’. Ines Subashka also states it is easier to be behind the screen. The results offer indisputable evidence that social media is manipulative and sets the foundation for a solid obsession with different aspects such as healthy living and eating, fitness, diets, body image, beauty ideals, comparison etc. All interviewees agree that social media sends subconscious messages. As Pavlov emphasises ‘the social factor is very strong as the natural striving towards happiness is programmed’. These statements correlate favourably and further support the idea that Instagram is is more harmful than other social platforms (Fardouly and Vartanian 2015), which is highlighted in the literature review. Overall the findings suggest that motivations for using Instagram include the need to present life as cooler, for helping other people with similar problems, looking at aesthetically pleasing photos, observing other people’s success, comparing with others and looking for approval. 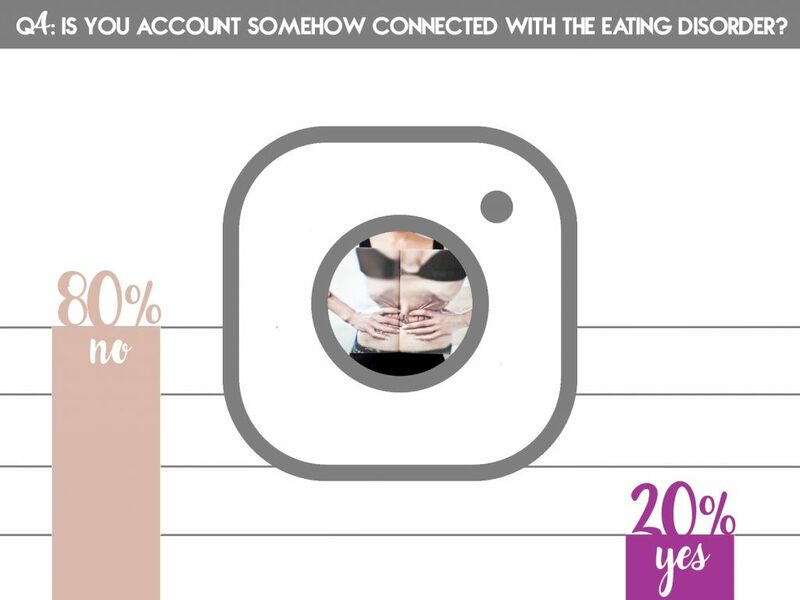 The majority of respondents felt there is no connection between their Instagram account and their eating disorder. Only three of those participating indicated that there is a link to a certain extend (like a culinary blog). Objective N1 [Determine how Bulgarian women aged 18-35 see Instagram and evaluate how using it makes them feel] and Objective N2 [Examine what role eating disorders play in using Instagram as a social media platform for sharing] were not fully met as there was no significant correlation between using Instagram and having an eating disorder. Further analysis showed that Bulgarian women with eating disorders feel like they either do not need to share their ED related thoughts online or are ashamed. 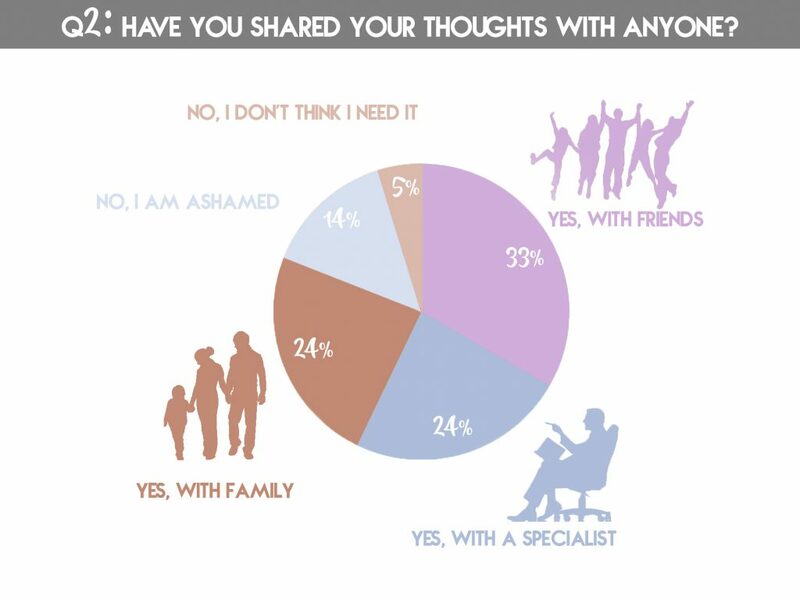 With a few exceptions, our results show that most people are willing to share information about their eating disorder to people they already know. On the other hand, this finding somehow confirms the usefulness of Instagram as an escape and as a place where women feel more protected and more secured to write, post and share their thoughts. Objective N3 [Investigate if the participants have more than one Instagram account and whether any of the content is connected to their eating disorder] was successfully answered thanks to the clear questionnaire answers. These results offer indisputable evidence that Bulgarian women follow other people on Instagram with similar experiences.The most remarkable results to emerge from the data is that some participants want to present their life as cooler and are more willing to share online as this soothes them while others are absolutely categorical that they do not use Instagram with this purpose. This supports previous findings in the literature that having an eating disorder is influenced by many factors and could not be categorised in one way – each person is unique and ‘behaves’ with their eating disorder in a different way. As suggested by Derenne and Beresin (2017) society and media mutually influence each other and the idea that one one is to blame is wrong. There is no satisfactory agreement between the results and the outcome from Objective N4 [Explore the women’s motivations for using Instagram and sharing personal thoughts] is that no clear statement can be made as there are people on both sides – those who have the strong position they do not use Instagram with this purpose and those who state they feel better behind the screen, where they are hidden. Objective N5 [Carry out interviews with eating disorder affected women and psychologists working in the field and compare those responses] is accomplished and the conclusion can be read in the above paragraph. Given that the findings are based on a limited number of participants, the results should therefore be treated with considerable caution. Our findings appear to not be well supported and therefore no conclusion is made. As expected, results are contradictory and unsatisfactory. The study is unsuccessful in proving that Bulgarian women use Instagram as a place, where they are more open to share their eating disorder related thoughts. The reason for this rather contradictory result is still not entirely clear, but might me due to the low number of participants and not the not very clearly written questions. 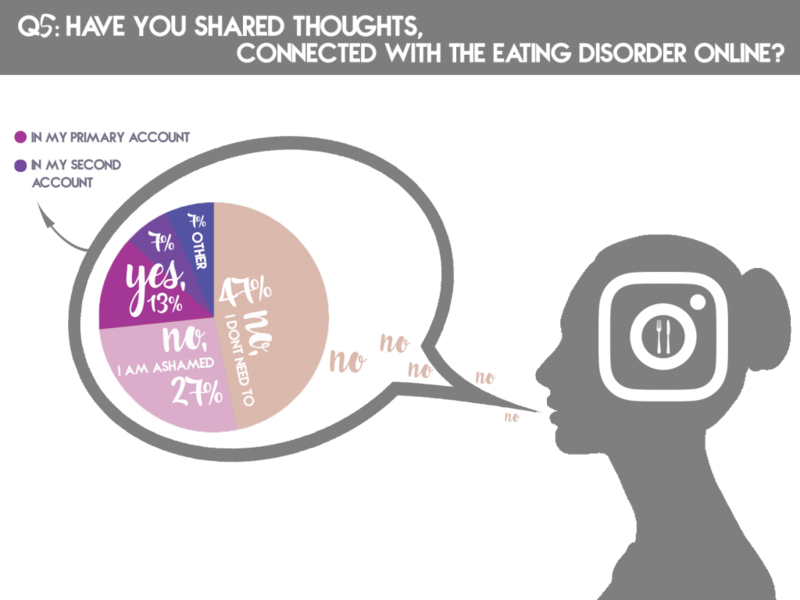 The aim to investigate how and why eating disorder affected Bulgarian women use Instagram is partially fulfilled. The five objectives are not completely met and the study is not reliable due to its scale. Although performance was not ideal, we still believe that the lack of depth could be beneficial for further research as this only sets the foundation for investigating the topic.